The Gambian leader has announced that the major target of his government’s Vision 2016 food self-sufficiency agenda is to bring a 99% direct benefit to Gambians from the country’s endowed natural resources. To make this target attainable, President Jammeh reminded the young people about their responsibilities and to be ready to work harder. His Excellency Sheikh Professor Alhaji Dr Yahya Jammeh made these remarks on Tuesday at the Cannan Technical Institute in Brikama as part of his nationwide agricultural tour in the context of his 2013-launched Vision 2016 food self-sufficiency agenda. 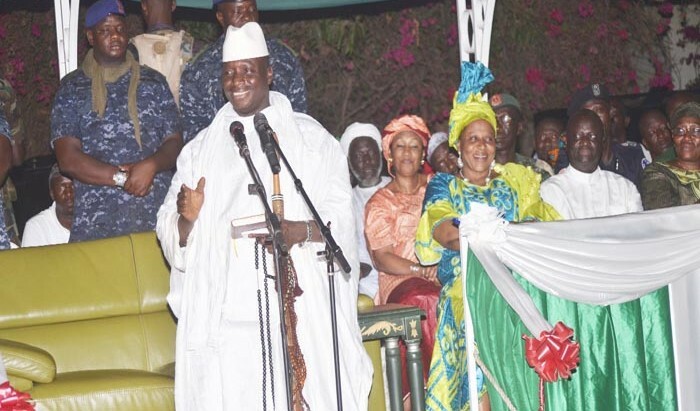 President Jammeh equally called on Gambians to love and stand for one another, saying the people must maintain the brother and sisterly relations that bind them together. “It is in The Gambia where you will see a Gambian helping a foreigner and deny his or her fellow Gambian,” he said. He further told the gathering that since 1994, he has been calling on every Gambian to plant at least one fruit tree every year; a call he said, was answered by very few people. The President further announced that in addition to his ‘Eat what you grow and grow what you eat’ slogan of the Vision 2016 agenda, the slogan for communities in the Kombo will focus on the marine sector; ‘Eat the fish you catch and catch the fish you eat’ will be used to encourage the people in Kombo, particularly the young people to exploit the marine resources. He indicated that meat and fish are costly in the country today because the business is predominated by foreigners. He also lamented the hiking of prices of commodities by business people during the holy month of Ramadan, saying Muslims themselves predominantly make this act. At the Brikama meeting, President Jammeh announced the naming of new roads after prominent Gambian for their efforts in the development of the country and their loyalty to the President and the APRC party since 1994, as part of Gambia’s 50th independence anniversary celebration. The Brikama-Gunjur Road was named after Amadou Samba, the Brikama-Busura Road was named after Alhagie Musa Babadinding Ceesay, Brikama-Sanyang road was named after the late Seyfo Eric Tunde Janneh, Brikama-Darsilami raod was named after Dembo Keleng Bojang and the Mandinaba-Soma toad was named after the late Jamil Ali Farage. President Jammeh said Samba, Ceesay and the Late Farage are genuine Gambians who are today reaping the benefit of the hard work they did towards the country’s development. Bala Garba Jahumpa, minister of Works, Construction and infrastructure, said President Jammeh’s ultimate aim is to develop the entire country, saying the Vision 2016 agenda targets to revolutionalise agriculture in the country where the people will benefit from their sweat. 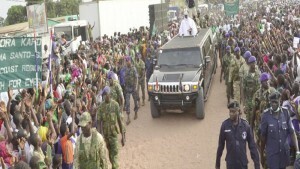 According to him, for 32 good years, roads ranging from Brikama, Gunjur to Busura, the Kombo Coastal, Mandinaba-Soma and Seliti roads were all in dilapidated conditions but with the coming of President Jammeh-led government, they have all been constructed and transformed into first class roads. “We have to all understand that politics does not call for being a Jola, Mandinka, Wolof or Fula but it is a tool for development,” he said. Dembo Keleng Bojang, chief of Kombo Central and Alasana Bojang, National Assembly member of Kombo East constituency both commended President Jammeh for coming up with the Vision 2016 initiative, which they said will help Gambians to benefit from their endowed resources. Amadou Samba and Alhagie Musa Babadinding Ceesay, the two who were named after the Brikama-Gunjur Road and the Brikama-Busura Road both commended the Gambian leader for the honour. “My family and I are grateful to the honour and we assure that we will always stand to support you,” Amadou Samba said. “President Jammeh is a leader who always reciprocates people’s good deeds accordingly,” said Alhagie Musa Babadinding Ceesay. Alhagie Lie Jarju, alkalo of Brikama Daru Hairu and Tabali Bojang, the Kombo Central APRC chairman commended the Gambian leader for the initiative.